Feeling overwhelmed with choice whilst planning your luxury Australian vacation? We have broken down the must do’s and everything in between to make the most of your vacation to Australia! As far as experiences are concerned however, one MUST do tour is the Ultimate Sydney Sailing Tour. This tour allows you to see Sydney from all angles. We begin the day at 10am so you have time to sleep in, (and get over your jetlag!) have breakfast and start the day fresh! Explore the rocks precinct and then work your way through the city exploring the Botanic Gardens before venturing out to the Eastern Suburbs. Experience lunch at a private yacht club before dipping your toes in the water on Bondi Beach. This afternoon you will board your private yacht for a 2 hour sail on the harbour. Can your fist day in Sydney get much better? More interested in discovering the local food and wine scene? Then you MUST experience the Sydney Food and Wine Trail. This tour takes you on a culinary experience with the locals. Venture into the trendy and emerging suburb of Chippendale for a coffee experience like no other. They are serious about their coffee in this part of town! Immerse yourself in the fabulous street culture. If you are seriously into your art then you can’t go past nearby White Rabbit Gallery. Next we visit a private cheese boutique and sit down with their cheese expert in the maturation room. Enjoy a tasting of Australia’s finest matched with the perfect glass of wine. For lunch dine at a local favourite in the heart of Woollahra, which is famous for its quiet, tree-lined residential streets and village-style feel. Enjoy a true paddock to plate experience. This restaurant grows its own produce on site. Want to finish your day with an epic dining experience? Grants favourite Sydney Restaurant: Mr Wong – a fun exciting atmosphere with great service and food. You can’t reserve a table here so put your name down on the list and venture around the corner and underground to Palmer and Co for a cheeky vino before dinner. Elise’s Favourite Sydney Restaurant: Cafe Sydney – Not only are the views across the harbour unbeatable, it has amazing food and service to match. You need to book in early for this one though and don’t forget to request a table outside. The North of Australia is dominated by two World Heritage listed Australian marvels. The Daintree Rainforest and The Great Barrier Reef. Both natural wonders are MUST do’s if visiting Tropical North Queensland. Spend an awesome day of discovery on a Daintree Wanderer tour. After enjoying a magical cruise to spot crocodiles along the Daintree River, the rest of your morning is spent exploring deep within the oldest rainforest in the world. The tour is highly educational so you will be sure to learn a thing or two about the unique native flora and fauna. Visit Cape Tribulation and lunch at a rainforest restaurant. Enjoy beach walks and visit a local ice cream store in the afternoon that makes its own tropical flavoured ice cream on site. You can also upgrade this experience and be hosted by an Aboriginal guide and learn all about their rich culture. The Great Barrier Reef speaks for itself. But don’t take our word for it. A visit to swim in its sparkling waters and revel in its marine park environment is an absolute must do. There are many operators out to the reef but be sure to pick the one that suits you. Quicksilver are a well known local company that transport passengers to their exclusive pontoons positioned in some of the best parts of the reef. You can spend the day on these football field sized pontoons and swim and relax at your leisure. Enjoy lunch at the pontoon before heading back to shore in the early afternoon. These are large boats and the pontoons can get quite busy. Looking for something a little more intimate? Then we suggest Sailaway Cruises. Hop aboard your luxury catamaran for a personalised experience with up to 30 passengers only. No pontoons supplied here but you will sail away from the crowds to exclusive parts of the reef to enjoy swimming and snorkelling. Grant’s Favourite Cairns Experience: Have kids in the group? Then you can’t go past Jungle Surfing! 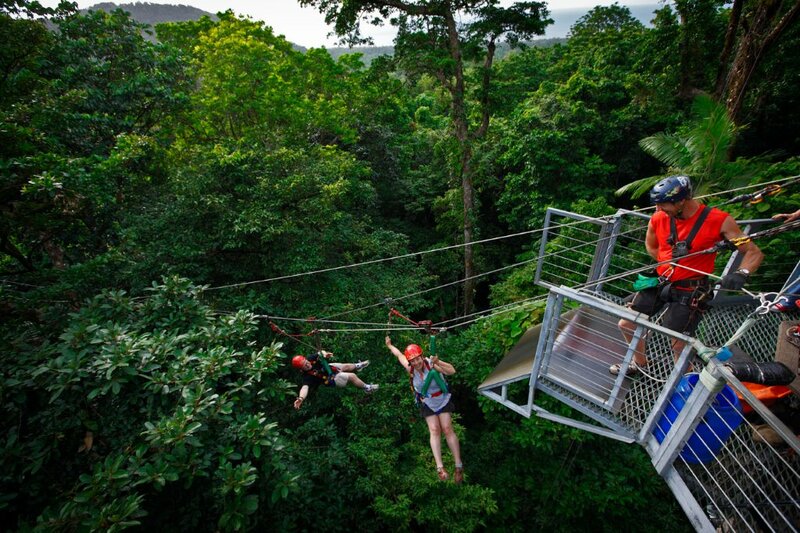 It takes you into the beating heart of the Daintree Rainforest on a guided tour through six tree platforms, seven ziplines and the world’s first Human Hamster Wheel cable lift. The platforms range from 5 to 19.5 metres above the ground and each one reveals a different level of the rainforest ecosystem with unique and spectacular views into the canopy, over the treetops, down to a bubbling creeks and out to the Great Barrier Reef. Elise’s Favourite Cairns Experience: Combine the Daintree Tour with an Aboriginal Experience hosted by the Walker Brothers. Follow their cultural guide with your own spear along Cooya beach and be introduced to their traditional fishing activity, spear throwing and handling. Observe cultural medicine and food plants and learn about the amazing Aboriginal culture. The official style capital of Australia, Melbourne can sometimes be confusing. It is well known for its street culture and hole in the wall cafes, however fewer people are aware of Melbourne’s stunning outskirts. Here are 3 must dos. Start with a laneways tour. Melbourne is built like a small European city so one the best ways to discover it is on foot. Your private guide will walk you along the banks of the Yarra River before heading into the network of hidden laneways. Using a private guide is the only way to take this tour as your experience can be tailored to suit your tastes. Want to experience street art, historical arcades, the best hole in the wall cafes? Your private guide can provide you with all of this and more. The Great Ocean Road to the west of Melbourne was constructed just after the second world war employing thousands of returning serviceman. It was an engineering masterpiece winding its way along a rugged coastline. Today it is consistently voted as one of the best drives in Australia. The jagged limestone monoliths that ascend their way out of the ocean are the backdrop to a stunning landscape. Be sure to take your camera for picture post card photos your friends and family will be in awe of. Treat yourself with a helicopter flight back to Melbourne for a different view of the coastline. For a unique and authentic wildlife experience it is hard to go past Phillip Island. Located to the south of Melbourne, Phillip Island is well known for it fury little penguins that come ashore each evening. Apart from penguins, you will also see koalas, kangaroos and wallabies. Take a walk along a coastal boardwalk for stunning views of the ocean and rugged coastline before enjoying dinner at a seaside cafe. 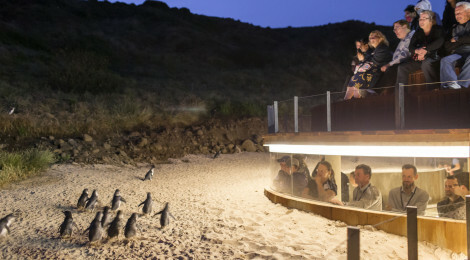 Later visit the Phillip Island Nature Reserve where your private guide will position you at a smaller more intimate viewing platform away from the swelling crowds. Grant’s Favourite Melbourne Experience: If you are a sporting buff then you should explore the inner sanctum of the Melbourne Cricket Ground (MCG) where legends play by taking a guided behind the scenes tour. Elise’s Favourite Melbourne Experience: Melbourne is renowned for its food and wine scene and Vue De Monde is hands down my favourite restaurant. It pays homage to classical fine dining in a modern context. Not only is the food amazing, it is located to the 55th floor of Melbourne’s iconic Rialto building with sweeping views across the city and beyond. Want to know more about Australian Private Touring? Visit our websIte or email our reservations team to learn all about the unique experiences we offer throughout Australia.